The LED photography lights offers a bright, soft light output, with precision controls, in a compact form-factor,for on-camera applicationsand is just as ideal for AC-powered, continuous studio setups. Use of tightly-binned LEDs and fine-tuned TIR (Total Internal Reflection) optics, continuous video lighting are ideal for you YouTube studio and cameras on-location shoots,With Overheating protection, safe to use. 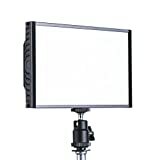 The latest L-162 lights are ideal for both YouTube studio and on-location cameras shoots. In addition to delivering higher-quality color rendering, they can be powered by professional camera batteries, making them ideal for studios looking to save power and reduce costs. Power on/off, dimming, and color temperature are controlled from the back of the fixture via four buttons. A two-digit LED screen is shared for dimming and color temp, with an indicator light informing you of which characteristic you are controlling. The built-in diffusion helps prevent the effect of multiple cast shadows that afflict some LED array-type lights. A built-in 1/4″-20 threaded mounting hole, and the included cold shoe adapter enable mounting the fixture on your camera. The technological advancement and enhancement is evident in the high CRI and significantly increased brightness due to the use of tightly-binned LEDs and fine-tuned TIR (Total Internal Reflection) optics, resulting in a longer throw over a wider field. On the back of the fixture are four buttons:Power:on/off,Plus,Minus,select-M.The M button enables switching between dimming and color temperature. An LED indicator lights up to indicate which characteristic of the fixture you are controlling. A two digit display screen indicates dimming from 10 to 99% and color temperature from 3200 to 5600.